NCS means nerve conduction studies. Nerves in the human body are functioning like electric cables: nerves are transmitting information via electrical impulses. With an NCS examination the ability of electric conduction of the nerve fibers is tested. The test results say whether nerve fibers function properly. What is the objective of an NCS examination? Which information can be obtained by an NCS examination? Nerve conduction studies are used mainly for evaluation of polyneuropathy or suspected focal nerve lesions (for instance in the case of disc herniation, carpal tunnel syndrome, etc). Generally speaking, the health of your peripheral nervous system (basically, this means all of the nerves outside your brain and spinal cord) is tested by an NCS examination. With an NCS examination the ability of electric conduction of the nerve fibers gets tested: how fast is the conduction velocity? How much of the signal is actually transmitted? Is the signal somewhere delayed or is there a block of conduction? Is there damage to a nerve? Where is the damage located? How severe is it? Testing sense of vibration. This is usually one of the first steps when examining for polyneuropathy. 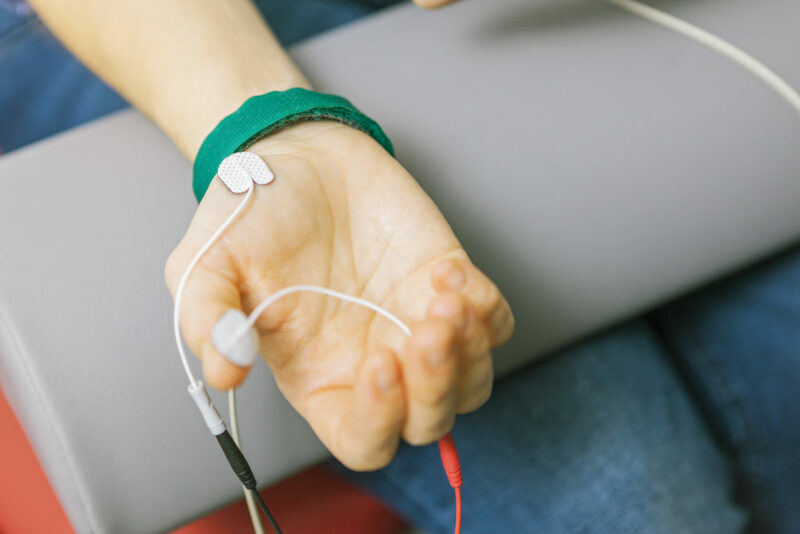 If there are abnormal or equivocal results, then a nerve conduction study should be planned. Polyneuropathy:Classes of polyneuropathy are distinguished by which part of the nerve cell is affected mainly: the axon (~wire of the cable) or the myelin sheath (~surrounding isolation of the cable). Which part of the nerve cell is affected can be clarified in a nerve conduction study. This gives very important information to decide on the cause of polyneuropathy and counsel on treatment options. – One of the most important questions, in my opinion, is to search for inflammatory causes. Because inflammatory polyneuropathies are oftentimes overlooked, do lead to irreversible nerve damage and gait disturbance, but on the other hand can very efficiently be treated (if the diagnosis is made early). Nerve injury:In the case of nerve injury, the degree of nerve lesions can be graduated based on electrodiagnostic testing (neurapraxia, axonotmesis, neurotmesis). Chances of spontaneous regeneration differ substantially between these different degrees of nerve lesions. 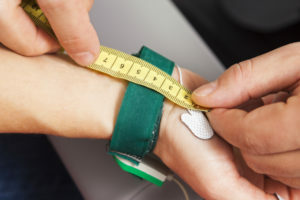 This has implications for the planning of therapy.In this situation usually nerve conduction studies (NCS) are complemented by electromyography examination (EMG). 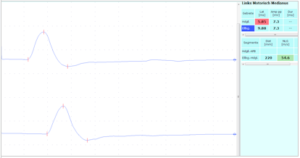 Using EMG it can be shown, whether regeneration processes have already started and how they proceed over time. Nerve entrapment syndrome (“pinched nerve“) Nerve conduction studies are very helpful in confirming the diagnosis, quantifying the severity, and ruling out the involvement of other nerves. Are symptoms actually caused by nerve entrapment? Which nerve? Where exactly? Are nerve fibers irritated or damaged? How severe is the nerve damage? Is an operation necessary to release pressure on the nerve in order to restore nerve function? Disc herniation: The single most important question that can be answered using electrodiagnostic studies is, whether nerve fibers are merely irritated or whether nerve fibers are damaged. If nerve fibers are damaged, then there is a risk of developing neurological deficits. If nerve fibers are irritated, there is no such risk. Without electrodiagnostic testing, these situations can oftentimes not be differentiated from each other. Thus, in my eyes, the electric functioning of the nerves is the most important criterion to decide, whether an operation is necessary or not. What happens during an NCS examination? For an NCS examination, in a first step surface electrodes are taped to the skin at different locations along specific peripheral nerves. 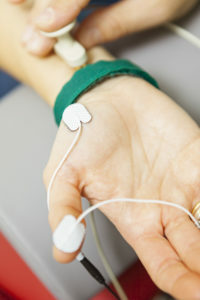 Next, the nerve is stimulated at one site through a hand-held electrode (see photo) placed on your skin. Each stimulus is small, very short lasting and absolutely safe. These impulses are recorded at a different site. Each electrical stimulation is recorded as a waveform on a computer and analyzed by the neurologist performing the test. Nerve conduction studies are done to determine if the nerve is conducting appropriately. It is often important to distinguish between sensory and motor nerves, as certain disease processes can affect one or both. 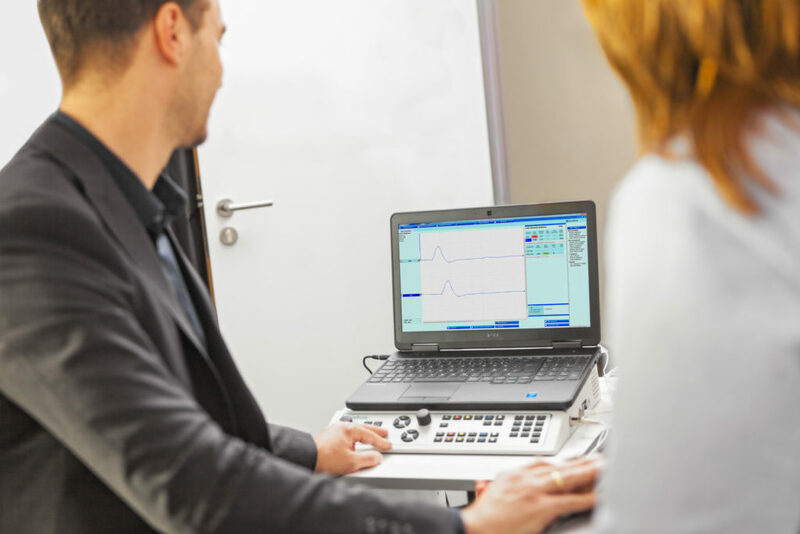 Sensory nerve conduction studies are performed via stimulation of a nerve at one point and measurement of the potential at another point along the course of the nerve. (During sensory nerve conduction testing you will feel the skin in the area of the nerve to tingle.) In motor nerve conduction studies, motor nerves are stimulated until a muscle twitch becomes visible (you will feel the muscle twitches caused by the stimulus) and then the compound muscle action potential from the muscle is recorded. The nerve conduction velocity (speed) is calculated by measuring the distance between electrodes and the time it takes for electrical impulses to travel between electrodes. In the case of carpal tunnel syndrome, the speed with which an electrical impulse travels in the median nerve across the wrist, is measured carefully. In people with carpal tunnel syndrome, this nerve impulse will travel more slowly across the wrist than normal. Nerve conduction study of the median nerve showing a slowing of conduction velocity at the wrist, but not in the forearm. Is an NCS examination painful? Nerve conduction studies are not especially painful and are often compared to a TENS-machine. In order to measure nerve conduction, an electrical stimulus has to be applied to the nerves. The stimuli are associated with a low amount of electric current, so they are not dangerous to anyone. Most people tolerate the test quite well with little or no discomfort. 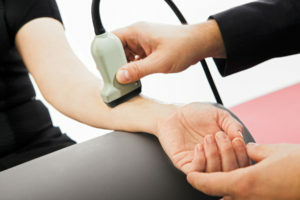 Many people who have used a TENS-machine say the feeling is very similar. If there is anything that you feel is too uncomfortable please let me know – we can always stop the examination in this very second and discuss alternatives (nerve-sonography for example: www.nervenultraschall.de). Is an NCS examination dangerous? There are no serious side effects or risk of lasting deficits. The test is not invasive. The equipment used is extensively tested and is safe. In the case of a cardiac pacemaker or any other electrical medical device, I will avoid stimulation of points near to these devices (which is rarely indicated anyway). Before nerve conduction study you will be asked whether you do have a pacemaker. But even then there are no serious concerns: Cardiac pacemakers and implanted cardiac defibrillators are used increasingly and no evidence exists indicating that performing routine electrodiagnostic studies on patients with these devices pose a safety hazard. How can I prepare for the NCS examination? For nerve conduction studies, adhesive electrodes will be placed on your skin. You can help by wearing clothing that is loose and easily removed. Short sleeved clothes can make tests a bit easier to do, some people prefer to wear gym shorts. If possible do not wear jewelry (bracelets) or watches that are difficult to remove, as you will be asked to remove them before the test. Please don’t apply lotions or creams before the exam as they make it difficult to get good recordings. In winter time, it is advisable to wear gloves, as skin temperature can influence conduction velocity. You can drive yourself and return to work following the test. What kind of medical training do doctors who perform NCS have? What is nerve sonography (neuromuscular ultrasound)? Sonography of nerves and muscles (also called neuromuscular ultrasound) is a new and emerging field of medicine. Recent advances in technology allow doctors to see even changes of small human nerves with ultrasound. This oftentimes of great help for diagnosing and treating neuromuscular disorders.